Inspired by Sew Mama Sew, I'll be hosting another giveaway starting Dec. 13 and ending Dec. 17. For one extra entry, Follow me on Twitter, Google Friend Connect, or Facebook, whichever you prefer. Tell me what you did in the comment. One winner (chosen by Random.org from all comments submitted) will receive a handmade felt pet stocking personalized with their pet's name! I'll message winner for the details, so make sure you are following me. Contest ends at 9pm EST on Friday, Dec. 17. Item will be shipped is U.S. or internationally. 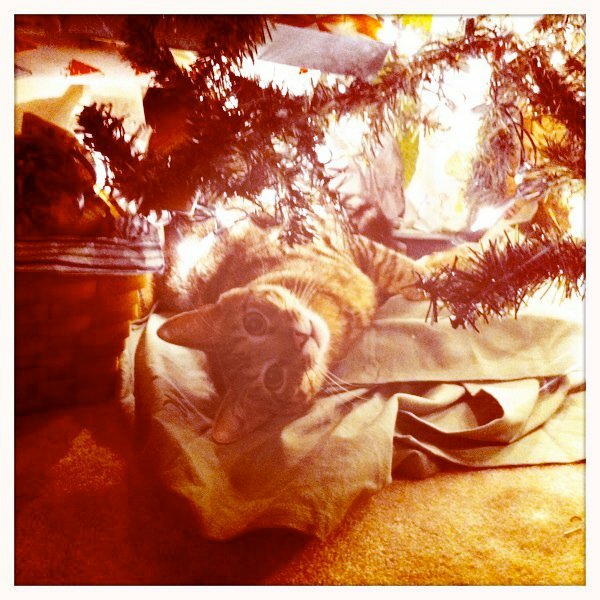 So, what's your pet getting for Christmas? Haven't shopped for Murphy yet, so I need ideas. My dog Lucy will get a nice "Big Mean Kitty" stuffed animal and my cat Jax will get one of those fountain water bowls. He doesn't like his still water. I'm hoping he'll prefer the moving water. Thanks for the giveaway! This would be great for my mom's dog Trooper! Thanks Chris and Heather! I just changed the contest rules to shake things up, but I will give you each two entries. No need to re-comment. Our dog Colin is getting some chew toys. I would love to win because I sewed up three stockings (one for me, my husband, and our son) and I'm a little burned out at the moment, so I'm not sure if Colin will get one in time for Christmas. Thanks! This is so funny! I was just telling my husband that my Thatcher needs a new stocking! She has this generic old crappy one and my Maggie, our older lab, has a fancy pretty dog stocking! This would be SO perfect so Thatcher doesn't get the shaft this time! LOL! We usually get them each one toy and then fill their stockings with popcorn or another fun treat! My doggie actually needs a stocking! thank you so much and Merry Christmas! We don't have a pet but three kids instead! they're like big pets! I love the photo of your cat under the tree. SOO cute! Thanks for visiting my giveaway and leaving a comment! Zoe would LOVE that stocking for Santa to fill! I have two dogs: Milo and Rosie. Both are completely spoiled. They are, at least, getting treats for Christmas. I've asked their grandparents (my parents) to splurge on some toys. Regardless, they'll get lots of love! My Greyhound, Jackson, will get some squeaky toys (which he will destroy in approximately three minutes), and some homemmade molasses biscuits. How cute!!! The only purchase we have made so far is a new toy for Kiki (which may last until New Year's if we're lucky) The others don't care much about toys anymore...preferring T-R-E-A-T-S!!! I do also have 2 grandoggies and 2 grankitties. The dogs will be getting a toy and treat and the kitties will be getting treats and catnip toys! Our dog's name is Shera. She is really my mom's dog, but we got her when I was still living at home, so she's my dog too. She always gets toys for christmas, and loves to rip off the wrapping paper. We have 2 fox terriers (Piper and Sooty) and 2 cats (Moose and Kitty) - I'm not sure just what they'll be getting yet, but they won't be missed out this Christmas...it's sure to be edible that's for sure! our four kitties (tyler, charlie, sophie and kady) will be getting some new catnip mice and bags of treats. cute stocking! Scout is getting treats and fancy canned food. Yum! Thanks for the chance! My dog Casey will probably be getting a few toys and some rawhide bones.. he loves them but we don't buy them enough for him! Hannah the dog is getting a fabric gingerbread house to hide treats in, which she must then work hard to remove! keeps her out of trouble when I am at work. For your Murphy I suggest needle-felted "mice". But something fun in the middle like catnip or dog hair or something he likes to smell, then wrap felt around. Takes very little time and they LOVE to bat them around and attack them. No pets allowed. We rent. Love the adorable stocking, though. May I still enter for a decorative stocking? That said, "Joy"? I have a dachshund named Maverick. He is getting rawhide bones for Christmas. New chew toys for Googly! I am having a giveaway on my blog as well - a gift card sponsored by CSN Stores. Please do enter! Great contest, and an adorable stocking! My Oswald LOVES to tear up and bunny thump rolls of paper towels. We have to keep them well locked up or he goes gonzo with them. Thanks for entering my giveaway, btw. Happy holidays! My dog Victor is getting marrow bones for Christmas (and the first one is at our party on Saturday). He loves them and they keep him busy! My boyfriend's dog, Gabe, will definitely be getting a football and a basketball for Christmas. It takes him under a minute to pop a basketball and then depending on his mood, he will either destroy it completely by tearing it up OR he will want us to play fetch until the wee hours of the night. I just love his excitement when he sees a nice, new, shiny basketball for him to play with. This is adorable! We have a few pets including a pet pig named "pigglesworth" lol! Bet you've never made a stocking for a pig before! This is super cool! My dog Koda would LOVE having a hand made stocking so he can get MORE spoiled! We have 2 Jack Russell Terriers - Abby and Derby - and if they don't behave, they'll be getting coal for Christmas, naughty little things. Just kidding; they'll get bones and a chunk of Rollover! His name is Duke and he is getting chewies, lots of chewies! I am running out of remotes, cordless phones, cell phones, shoes, etc. I'm pet-less, so don't count me in, but I wanted to say that your stocking with the fish is fabulous! My big guy Booker will be getting a new plushie to squeak (he already has a huge toybox, but he loves each and every one of his "babies"). I tried getting him a sweater and a coat, but he did not think that was such a great idea. Wallis our dog will be getting a squeaky toy that he will destroy in seconds and a bone. My cat Sylvester will be getting a container of catnip, which he goes berserk over. My boyfriend and I are getting his dog a collar and tags, since Beau still doesn't have them, for some reason. My little fox terrier Poppy would appreciate having her own stocking of treats on Christmas morning! Thanks for stopping by my giveaway! I'm a follower now on google connect. My dog Lobo is the family dog that lives with my parents. This year I think I'll give him lots of extra petting when I visit for Christmas. Thanks for the chance to win! Oh, Murphy is a cute cat! 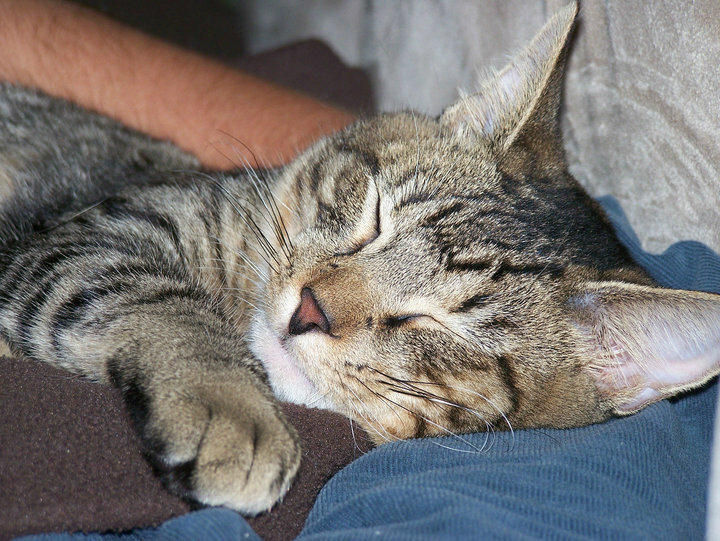 I have 2 cats, Orville and Wilbur, who will be getting visits from the catsitter for Christmas. Not what they'd pick out, but any time I put food in their bowl or toss them a crumpled-up crinkly receipt they act like it's a holiday. Thanks for visiting my blog and entering my giveaway! Well, we actually have 4 pets...a dog and three cats. Our dog's name is Jager...she is a Siberian Husky that is in the red color range. Then we have Crook, Benni, and Smokey (<----he was rescued from a fire when he was barely ready to be adopted). I have been thinking that I need to make socks for the pets. We usually give the dog bones for Christmas and the cats get new collars. My pug's name is Marlene. For Christmas she is receiving some yummy treats! We have a black labrador puppy called Spindle - she's getting a new toy as she loves to chew!! We have a cat named Wally who my son has been telling me needs a stocking and presents from Santa because Wally has been good. Awww, what a sweet giveaway!! My doggie is Chewie (Bichon Frise) and if I win I would love to pay you to make a matching one for his sister Bella (Shih Tzu). They are both two and bring so much joy to my life. Two Black Kitties have already gotten their first present - a new water fountain. That was more for Pixel than Mobius. I didn't want to make them wait as they don't care much about christmas other than attacking the wrapping paper. I also want to get them a bird feeder and hang it just outside one of the windows so that they can watch the birdies. Plus, since Mobius stole the sock monster I was working on for a friend and tried to keep it, I may have to make him one of his own. He's a funny boy, that Moe. I'd love to have a kitten, I would name it Coriolis... And if I was to have a dog, the only one I want is Snoopy ! My dog, Albie, is getting a big floppy plush crocodile for Christmas! Sylvester is getting more catnip for sure (because he is ALL OUT... oh noooo! *grin*), but other than that I haven't gone shopping yet. I wouldn't have picked that name on my own, but it stuck: at the pet shelter we were like, "What's the name of the awesome cat that looks like Sylvester?" and they were like, "Sylvester." Nothing better than a handmade gift! One is called "Puccini"...his Christmas present will be a furry new blanket to lay on the heating. The second cat I'm looking after is an old lady called "Madame"...living on the streets and fields. Her Christmas present will be a styrofoam house where she can hide and will be warm and cosy in those cold winter days. would love this for my dog. she is a stray i found on the side of the road this summer. we just found out she has glaucoma in one eye and is blind! aside from his usual treats my little guy is getting a blanket and maybe a new collar or 2. Columbus, our cat, loves cuddles, so he's getting extra cuddles on Christmas and a donation to our local SPCA where we got him. Thanks so much for the giveaway. our cays name is Dory and she will be getting a mouse and some cat nip. We have 2 cat's and 2 guniea pigs who all have there own stockings, filled with pet treats, snack bars and a caoort or two. 2 days ago we rescued a 3rd guniea pig so Mrs Smiggle will be needing a stocking, however she came expecting so not sure how many mini stockings I will be needing, so perhaps she could have a family one? Thanks for the giveaway, I am a follower. My dog's name is Chloe. She is getting some new food dishes and some yummy doggy treats. :) She has been using my old stocking from when I was a little girl... we put masking tape over my name and wrote hers. We sure would love a new stocking for her!! Hahah! I have two lovely cats, a quiet, patient, big, black and white male called Haggis and a cheerful, naughty, sharp, black as coal female called Sooty. They'll be getting a new blanket for Christmas! Would love one for our cat Maui! We got her a package filled with cat stuff from the local SPCA and the money went to help the animals! I had to hide it 'cause she could smell it! OH, Miss Bailey would love a stocking!! thanks for the giveaway!! Ok, my pet is not a dog or a cat, but a twenty-year-old turtle named Tofu. Don't know if that makes her elligible, but she sure would love the fish stocking. She'll get some fresh shrimps and crab for Christmas! my cat is Chloe and I've gotten her a couple of cat toys and refills for her cat feather stick. Well, that's super fun! Ursa the Dog would love her own stocking..I'm sure we'll give all the dogs a few raw hides and such! My fat little Corgi, Duffy, will get some new tennis balls, a box of Milk Bones and a new leash for his walks. Thanks for the great giveaway! what a cute giveaway! my favorite pet is my cat tux! he will be getting a new scratch-er! My weeenie dog is named Sammie and he is getting a new rope for Christmas. My Cocker Spaniel, Skyler, has been a VERY good girl this year and I am making her a cute San Francisco Giants fleece sweater! I love your stockings, so adorable! Adorable! We here at the clubhouse have a Mort (kitteh) a Milo (kitteh) and a Bella (goggie)! Kittehs are getting a new scratching post for Christmas and organic cat nip. Bella is getting rawhide bones and the privilege of licking the bowl. Monsters are kind of like pets, too? 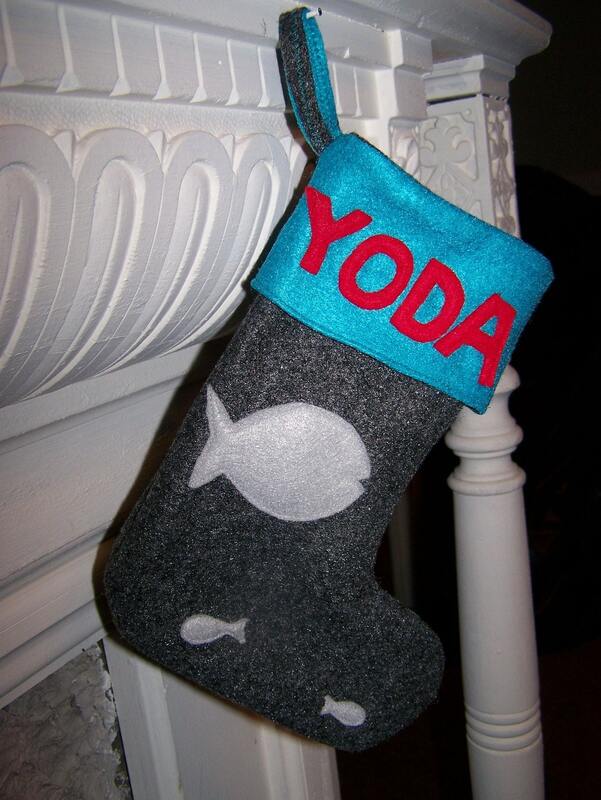 What a clever giveaway -- LOVE the fish on the stocking, hee hee. My princess's name is Zoe -- a tiny scrapper of a kitty! She will be getting more mice to bat around the house for Christmas this year! One of our cat's names is Tux. We're getting him a new water bowl in the shape of a fish. I just love this giveaway! Cute stocking. Noodles would love it. I have a dog named Opie. He is a lab/hound mix and was a rescue dog. For Christmas I make him dog treats and he gets a large bone from the butcher and Christmas Eggs (sunny side up)in his kibble on Christmas morning.